Welcome to my September 2013 income report! For those of you new to SPI, you might be wondering why I care to post my income reports in the first place. Before I get to the meat of this month’s report, if you’re just starting out online, please understand that making money on the Internet is definitely not an overnight thing. Not even close. It takes a lot of hard work and dedication to pull it off. The environment is always changing, which is why I continue to experiment and try new things, and share my results here on the blog. Leading up to the vacation, I was really interested to see what it would be like to be “off-the-grid” for a while. How much urgency would I have to work when I know I shouldn’t, and how well would my businesses run without me? All in all, it was a success. I did spend about 30 minutes each evening (after the kids were asleep) just checking in to make sure things were running smoothly. There was too much to do on the ship to even think about my businesses during most of the trip, which was the idea. It was nice to be 100% in the moment with my family, which is a major challenge when you’re an entrepreneur working from home. So of course, my entire family got sick at the tail end of the trip. We even had to go to the health care center on this ship to get the kids some antibiotics – it was pretty bad. I didn’t feel the effects until after I got home though, but when I was ready to get back into work, I didn’t have the energy to think. After a few days of rest, I was finally able to get moving again, and that’s when I saw that I had about month left until my very first keynote presentation at The Financial Blogger Conference (FINCON) in St. Louis. My opening keynote presentation happens this Friday, October 18th. I made a decision to put most of my energy into prepping this presentation – not only because I wanted to nail my first keynote, but because this conference and the community it serves means a whole lot to me. You see – in 2011, I was deathly afraid of getting on stage and speaking in front of a crowd. I knew that it was something I should do to expand my brand, increase my authority and become a better communicator, but I was too scared to actively seek public speaking opportunities at the time. Philip Taylor from PTMoney.com decided to start FINCON in 2011 to bring together the financial blogger community. He personally asked me to speak at the event, and because I knew a lot of people in that niche already (I used to read a ton of personal finance blogs while still working my architecture job), I decided to go for it. Speaking at that event was one of the most fulfilling experiences of my career, and from that point forward I was hooked. I’ve since gone on to speak dozens of times at over a dozen different events, to a point where I’m now actually getting paid to speak , and I owe it all to Philip and the financial blogger community. They were extremely friendly, receptive and made me feel completely comfortable during my very first speech. With my decision to go full-steam with this upcoming keynote, I knew that meant other things would have less of my time. Yes, a lot of my businesses run semi-automatically, but the one thing I know requires my time is this blog. A few of you have expressed concern, but before anyone else says it, let me say it myself: I know content production has suffered recently – not really in the sense that I haven’t been producing as much content (I’m still sticking to the weekly podcast schedule and blog posts are still being published) but as far as the traditional, EPIC, tutorial style SPI posts that I know you all love (and I love to produce) – it’s been a while, I know. A lot of my colleagues would probably call me out for actually talking about this because it’s just a few people who have expressed concerned, and I know it’s only a temporary delay that will go away once things settle down and get back to normal, but I like to be completely honest with all of you and share what’s on my mind. I’m here though, I hear you and I feel it too, but I also know it’s only a temporary hitch. Some of you may not even notice it, which means you have a lot more to look forward to either way. The redesign of SPI (which has been as slow as a snail) is finally under way. The plan is to release the new design in November as well, and the team working with me to make that happens knows it too. Life does happen, but I also know that SPI wouldn’t be here without you, so I’m not going anywhere, and I plan to produce the amazing, epic content that I know you’re all used to and hoping for again soon. Thank you all for always – ALWAYS – being open and honest with me too. I do what I do here on SPI for you, so I always appreciate when you keep me headed in the right direction. So, How is SecurityGuardTrainingHQ Doing? Like I said, I’ll be writing a lot about my food truck niche site once November rolls around, but my older niche site at SecurityGuardTrainingHQ.com is still going strong. 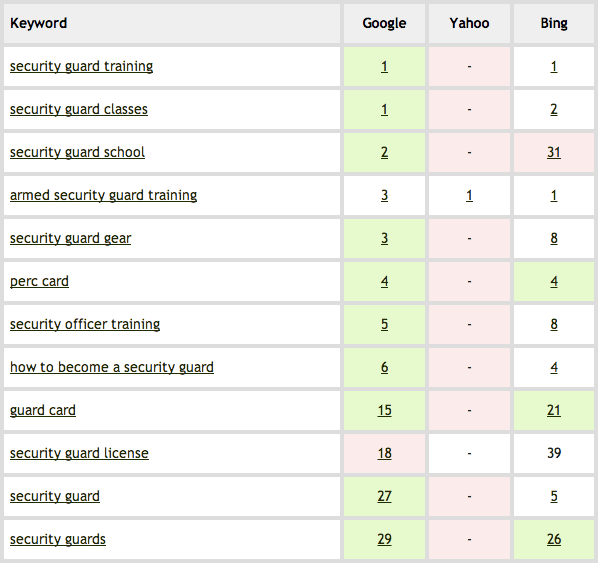 I did add something new to the site in November: a searchable directory that lists security guard training companies around the United States. This was information that was collected by my virtual assistant a few months ago. There are plugins such as this one that will allow you to include a business directory onto your website, but they weren’t compatible with my custom theme so I had to get it custom made instead. I was curious to see if adding the directory would affect my traffic or earnings in any way, and so far – it has not. It IS being used, which is nice to know, and it does add value to the site in whole – but I haven’t seen any direct correlation between the directory and traffic or earnings. The views on the directory pages are minimal. The site is still earning around $1,500 per month and receiving about 800-1000 visits a day, which I’m extremely happy about considering I haven’t really touched the site or added content over the past year. I did receive another offer to buy the site but the passive income this site generates is still very attractive to me, and I’d like to let this ride, and hopefully add more to it in the near future. Ok, let’s get to the numbers for September 2013. For the previous two months, my net total income has dropped from $99,115 in July, to $84,263 in August, and now to $55,325 in September. It may look bad, but this was completely expected because both July and August were record months due to a launch for my Breakthrough Blogging course, and webinars for LeadPages, respectively. $50-60k has been average for the year. The uptick in sales from GreenExamAcademy.com was due to a recent announcement of the next version of the LEED exam coming later in 2014. When these announcements are made, people want to study and pass the test before the next version comes out, because traditionally the newer exams are much harder, and passing this version will quality you to be a LEED accredited professional without having to take the new one. I should see similar or steadily increasing numbers for this site through the end of the year, although it’s interesting because the holidays usually take a toll in the world of professional exams. My iPhone app business partner and I have also spent time in September redesigning our #1 performing app. With the recent launch of iOS7, we had to make some changes for the new platform, and we’re hoping for an uptick of sales come the holiday season. Traditionally, the holidays increase all app sales in iTunes because more people have iPhones, gift cards are sent around, and the younger folk are home on Christmas Break and spend lots of time on their devices. I’m still hearing a lot of success stories on iTunes, but I also know it’s more competitive now than ever before. For every success story, there’s probably a lot more not so successful stories, which we never hear. The app market is fun to explore, but it’s definitely still the wild wild west. Have any of you entered the market recently, and if so, how are things going? Please share, and feel free to link to one of your apps if you’re just started – I’d love to check out what you have going on. I’ll be the first to admit that a significant portion of my total online income comes as a result of this very blog that you’re reading right now – mostly from the products that I recommend as an affiliate, which are products I’ve used or am extremely familiar with and have helped me in one way, shape or form. My goal with the new businesses that I’m creating, including the food truck site that’s being built for NSD2.0, is to increase the non-SPI income side of my income report. Yes, $10k is a significant amount to be earning outside of the site already, but the SPI portion has grown so big, I feel like that income has overshadowed what I’ve been able to do accomplish outside of SPI – but I still feel it’s important to be transparent and share how much I’m earning here with you. The fact that every week I receive hundreds of thank you emails, and even a handful of hand-written letters from people who I’ve helped shows me that I’m doing things the right way. Thank you again for all of your support and encouragement! 2. I know I say this often, but I can’t say it enough: the community here at SPI is the best. I love how you’re not afraid to speak up, and like I said earlier, how you help keep me going in the right direction. I’m here for you, but you’re here for me to, and I’m so blessed for that. I could have easily gone WAY off track a long long time ago like so many other bloggers that I used to follow, but you’ve always encouraged me, tested me, and pushed me forward and kept my head on straight. I will continue to give back as much as I possibly can – I promise you that. Cheers, and wish me luck! Thank you for your undying support!